At CERN, Hunting For New Particles, Dark Matter And New Dimensions : 13.7: Cosmos And Culture With so many dedicated to solving nature's riddles at CERN, it's hard not to think of it as a modern cathedral, a link between reason and mystery, a place of pilgrimage, says blogger Marcelo Gleiser. This is how, more than 25 centuries back, the pre-Socratic Greek philosopher Heraclitus of Ephesus expressed the sense of mystery we all feel when we start pondering how the world works. There seem to be hidden mechanisms, secret pacts between the things that make the world the world, from the smallest building blocks of matter to the neurons in our brains to the way the whole universe is stretching out in its inexorable expansion. Science, at its loftiest, is about peering into these mysteries and so many more, trying to pry open some crack to let the light of reason shine in, illuminating nature's hidden ways. If nature loves to hide, we love to find — our curiosity, perhaps, our most defining trait. This month, I'm at CERN, the European laboratory for particle physics, where some of the world's brightest scientists and engineers try to figure out the stuff that makes the world, the fundamental composition of matter. 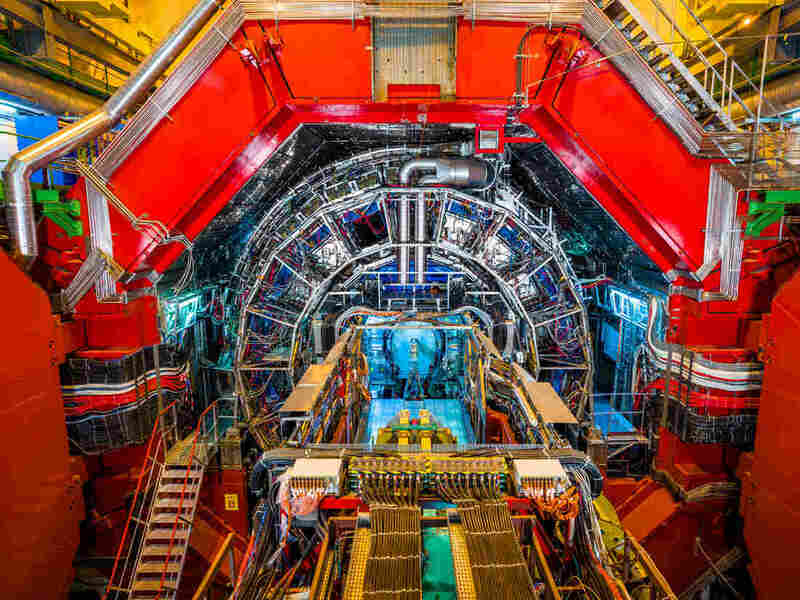 After the spectacular discovery of the Higgs boson in 2012, a particle that theoretical physicists had conjectured existed in the mid-60s, scientists have boosted the collision energies in search of the next big thing. Expectations are extremely high that something new will pop out, even if, so far, nothing seems to be out there. Is nature beating us at this game? One promising possibility for new physics comes from the Higgs itself. Could it actually be made of even smaller bits of matter? Many particles that once were thought to be indivisible were later found to be composed of even smaller chunks. Starting with atoms (that we now know are all made of only three particles — protons, neutrons, and electrons), protons and neutrons — and many other particles organized together under groups called baryons and mesons — were shown in the past few decades to be composed of six quarks, arranged in different combinations. Data from the highest-ever collisions are now being collected and analyzed to see if the Higgs is hiding something from us. We know that our current picture, called the Standard Model, is incomplete. There are too many open questions, begging for "new physics" — that is, physics beyond the Standard Model. If the Higgs is a composite particle, we will need to revise our current formulation and expand our view. And this is precisely what physics (and the sciences in general) is about: Expand knowledge from our current state of ignorance. But a composite Higgs is only one of many potential discoveries. Another one is "dark matter." About 26 percent of the universe is made of some kind of particle (or particles) we have no knowledge of. (For comparison, normal matter makes up only about 5 percent of the universe.) We know they are out there, because the matter we can see — the normal stuff made of atoms — gets tugged around by dark matter's gravitational pull. We see this in galaxies that rotate much faster than they should if all their matter was what we see. We also see this in groups of galaxies called clusters, where the galaxies move about one another with speeds much higher than they should. We even see the effects of dark matter in one of most amazing effects of Albert Einstein's General Theory of Relativity: the bending of light by matter. Peering into far away objects, we see their light distorted, bending and stretching as if it's going through a lens. This effect, called gravitational lensing, is a smoking gun for the existence of dark matter. We believe that dark matter is made of small particles that only (or mostly) interact with common matter through gravity. But if the collisions between protons at the LHC are powerful enough, it is possible, at least in theory, for some of the energy of the collision to turn not only into Higgs bosons and other particles, but also into dark matter particles. A theory that predicts their existence is called supersymmetry, and physicists are eagerly waiting for its signs. So far, nothing — and some say such theories are in trouble. But you only find if you search, and the search goes on. Another potential find, and this is the most exotic in our list, is extra dimensions of space. We move in three dimensions, east-west, north-south, and up-down. Seems simple enough. However, certain theories in physics predict the existence of more spatial dimensions, hidden from us due to their smallness. The same way that a hose, seen from very far away, looks like a line (and, thus, having only one dimension), these potential extra dimensions may be curled up in such small sizes that they escape our noticing. Estimates of their size vary from theory to theory, from extremely small and undetectable at the LHC, to just marginally detectable there. The odds are long, but the impact of such a discovery would be so spectacular that the search is on. How could you find extra dimensions? They would be mapped under "missing energy" — that is, an unbalance in the very precise accounting in the collision energy and its many products. Particles would escape into those invisible worlds, not to be seen again. Even more extreme, proton collisions could create microscopic black holes, ephemeral knots in the very fabric of space that would evaporate in a puff of radiation in a tiny fraction of a second. No, those black holes would not be a threat to our existence, as some needlessly feared a few years back, but they would be the ultimate proof of the interconnectedness of all things in nature, from energy to matter to gravity to space itself. In the Middle Ages, people would make pilgrimages to huge cathedrals in search of answers to their existential questions, hidden, they believed, in invisible realms. When we witness what goes on at CERN, with its tens of thousands of scientists, engineers and students — all dedicated to finding answers to nature's riddles — it's hard not to think of it as a modern cathedral, the link between reason and mystery, a place of pilgrimage in our troubled times.